(May 7, 2018) When we’re asked what the Giant garter snakes eat, we always respond by saying mosquito fish and tadpoles and similar small aquatic organisms. And, after nearly two decades of observing the Giant garter snake on Conservancy preserves, we can attest to this answer. Time and again, we see that this is what they eat. As one of the two “Primary species” listed as “Covered Species” under the Natomas Basin Habitat Conservation Land and the Metro Air Park Habitat Conservation Plan, we take great care to make sure there is plenty of prey of this nature for the Giant garter snakes to eat. 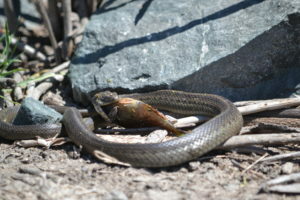 However, recently on the Conservancy preserves, we witnessed a Giant garter snake eating a large green sunfish. I use the word large because the sunfish consumed by this Giant garter snake was many times larger than a mosquito fish or a tadpole. Maybe it is fitting that one of the Giant garter snakes on the Conservancy’s preserves gobbled up a green sunfish. That’s because sunfish are believed to eat Giant garter snake newborns, which look very worm-like at and soon after their birth. We have video of this event, and it is dramatic. What the video depicts is a Giant garter snake, which we believe is a young-ish male (we say “young” because it is not very big) on a Conservancy preserve, maneuvering the green sunfish away from water and into a position where it can eat it. What is not seen is another segment where the Giant garter snake literally pulls the green sunfish through bankside vegetation to the scene first shown in the video. WARNING: if you are squeamish about seeing how wildlife feed themselves on other wildlife, watching this video might be disturbing. For others, we think you’ll agree it is fascinating. For us, we are pleased that the managed marsh facilities built by the Conservancy are working well, and this video confirms that Giant garter snakes residing in them are getting some pretty big meals!